Proprietary Name: Cold-eeze Daytime And Nighttime Quickmelts What is the Proprietary Name? Non-Proprietary Name: Zinc Gluconate, Valerian, And Chamomile What is the Non-Proprietary Name? 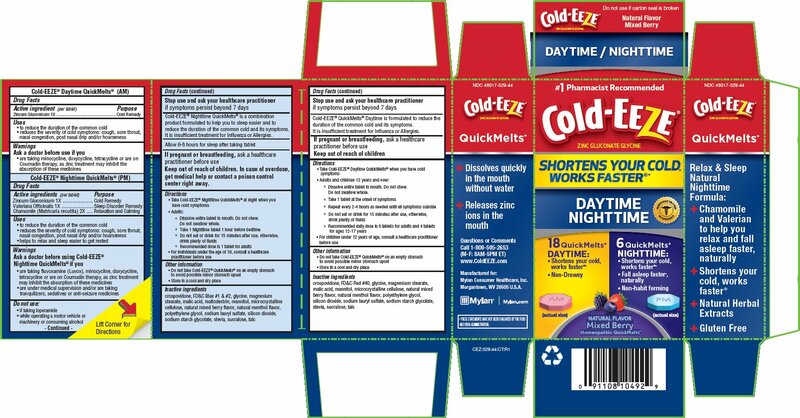 46017 - Mylan Consumer Healthcare, Inc.
Cold-eeze Daytime And Nighttime Quickmelts with NDC 46017-329 is a a human over the counter drug product labeled by Mylan Consumer Healthcare, Inc.. The generic name of Cold-eeze Daytime And Nighttime Quickmelts is zinc gluconate, valerian, and chamomile. The product's dosage form is kit and is administered via form. Labeler Name: Mylan Consumer Healthcare, Inc. If symptoms persist beyond 7 daysCold-EEZE® QuickMelts® Daytime is formulated to reduce the duration of the common cold and its symptoms.It is insufficient treatment for Influenza or Allergies.